Whirlpool announces a voluntary safety campaign for KitchenAid 1.7 Litre Electric Kettles. Brussels/Belgium, 20th February 2018 – Whirlpool Corporation and its brand “KitchenAid” today announce the launch of a voluntary safety campaign involving the Model Type 5KEK1722 KitchenAid electric kettle. The reason for this voluntary safety campaign is that Whirlpool believes the handle of the KitchenAid kettle can, in rare circumstances, separate from the upper attachment points to the kettle’s body and become unstable. Whirlpool has already implemented modifications at the point of manufacture to ensure that kettles now being delivered from our warehouses are not affected. 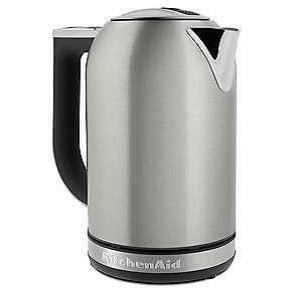 Note: the model number and serial number are located within the label on the base of the kettle. Whirlpool would ask any consumer who has one of the models, manufactured within the affected production range, to stop using the kettle and contact our Consumer Care Centre at toll free number 00800 552 27777 or 00800 381 04026 from 9:00am to 6:00pm, Monday through Friday. Consumers can also visit www.repair.whirlpool.com to determine if their electric kettle is affected. Whirlpool will replace all affected kettles free of charge to the consumer.